Published in the South Kent Gazette, 18 July, 1979. Cannon Street is short, but its story is long, because its associations run deep into local history. The name is not mentioned in the numerous charters and deeds which for many years were stored in the Dover Corporation’s Muniment cabinet in the council chamber at the Town Hall. The thoroughfare, in ancient documents, is referred to as the King’s highway; and if it had borne any other name in those times, it must have been reckoned as a part of Biggin Street. There was a Canon Ward (spelt with a single “n“) in the earliest days of the Dover Corporation, being that portion of the town for which the Canons of St. Martin-le-Grand were originally responsible; and for that reason modern literary purists have urged that in the spelling of Cannon Street an "n“ should be deleted; but against that change of usage there are the following points:— (1) The area of Canon Ward was the Market Place; (2) the street was in St. Mary’s Ward during the time of the Canons; (3) the deeds of property in the street prove that Captain Henry Cannon, who was Deputy Governor of Dover Castle during the Commonwealth, later owned property in Cannon Street; and (4) that the usage from the time that the street first had a distinctive name is invariably in favour of spelling the name with the double “n.“ The presumption, therefore, is that the street was named after the Cannon family, who had property in it during the 1650s. Nevertheless, it would have been appropriate to have named this street after the Canons of St. Martin, for the land on both sides was originally their property. 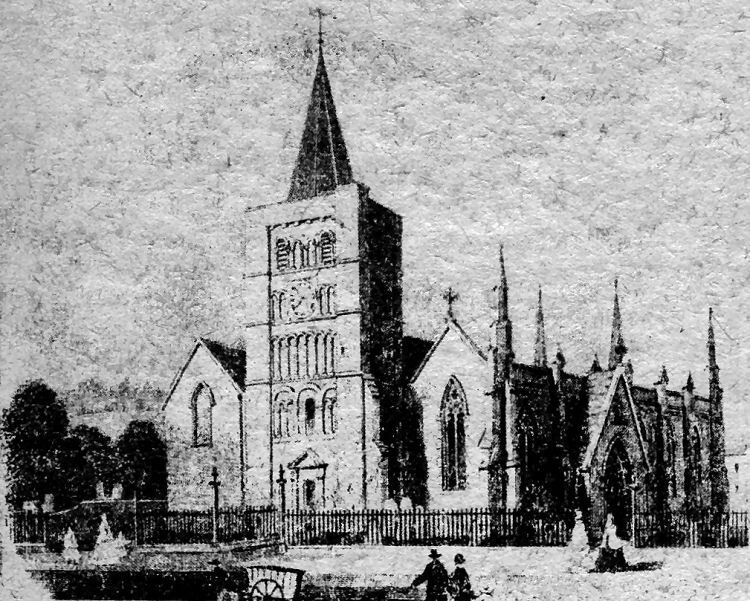 At the lower corner stood the west end and tower of the Church of St. Peter; and, higher up, as now, the Church of St. Mary, the churchyards of the two occupying the whole of that side of the street from the Market Place to Biggin Gate. A picture in the Sutherland collection in the Bodleian Library, painted by a Dutch artist, Antony Van den Wyngaerde, in the 16th Century, shows the towers and spires of these two Churches. Of St. Peter’s Church we wrote when dealing with the north side of the Market Place; but St. Mary’s, which is the oldest feature of Cannon Street, is worthy of special mention. Probably, some will be inclined to accept the statement of Lyon because he was minister of the Church, and ought to have known sufficient about the fabric to form a reliable opinion as to its architectural origin; but in the day when Lyon wrote, it was a common practice to describe as Saxon many churches which are now relegated by archaeologists to the Norman period. The small amount of genuine Saxon work left in English churches is easily recognisable, and there has not a trace of the Saxon builder been pointed out in any part of St. Mary’s in Cannon Street. That was the opinion of Sir Stephen R. Glynne, who visited the chinch in 1829. The round pillars and semi-circular arches at the western end of the church are early Norman and they are the most ancient part of the building. Assuming St. Mary’s to be of early Norman origin, it has been naturally asked for what purpose it was built, seeing that, at that time, there was the great church of St. Martin-le-Grand on the west of the Market Place, and also the Parish Church of St. Peter close by. St. Mary’s could not have been required, either for the living or the dead. A passage in Lambarde’s "Perambulation of Kent“ seems to warrant the conjecture that it was a part of the Norman Monastery of St. Martin-le-Grand, and built when St. Martin’s was re-built after the fire. Referring to the religious houses in Dover, Lambarde writes:- “Besides the Priorie of St. Martines (which was valued at a hundred fourscore and eight pounds), there was lately in Dover also an Hospital of St. Maires, founded by Hubert de Burgh, Earl of Kent, and rated at fifty-nine pounds, and another house of the same sort called Domus Dei (or Maison Dieu), reputed worth one hundred and twenty pounds.“ Was St. Mary's Church originally the Hospital of St. Mary’s? It seems highly probable. Lambarde was the most learned Kentish antiquarian of his time, and immediately after the Reformation, with free access to the records of the suppressed religious houses, he appears to have been writing from certain knowledge in saying that the Hospital of St. Mary’s and the Maison Dieu were, although of the same sort, two distinct establishments. We know that the Maison Dieu was established towards the close of the reign of King John by Hubert de Burgh, for the accommodation of poor priests, pilgrims, and strangers coming from and going to the Continent, and it was built adjacent to the newly-founded Priory; but the stream of religious pilgrims across the Straits of Dover did not commence in 1216, and it is quite reasonable to suppose that during the existence of the Monastery of St. Martin-le-Grand there were passing pilgrims, for whom it would be the duty of the Canons, according to Norman ideas, to make provision. A reason, therefore, appears why St. Mary’s was built, and it may be presumed that it fulfilled its mission as a hospital for religious pilgrims for a hundred years or more before the larger accommodation was provided at the Maison Dieu. One point on which Lambarde is evidently wrong is the statement that this Hospital of St. Mary’s was founded by Hubert de Burgh; it must have been founded more than a century earlier than his time, though when Hubert founded the Maison Dieu, the control of St. Mary’s may have been given to him, and when the upper house got into working order, the lower one, furnished with a mass priest, deacon, and sub-deacon, supplied by the Maison Dieu, became more distinctly a place of devotion, continuing to be so used until it was disestablished, with other religious houses, at the Reformation. Some of the fine detail of the much admired tower together with the ornamental wrought iron archway over the pathway to the main door. Note that the doorway did not have a rounded arch over it as it has today.